Readers of Flannery O’Connor’s Wise Blood will recall Haze Motes, a soldier who, after returning to his family home only to find it abandoned, travels by train to locate his preacher-grandfather and establishes his own “church of truth without Jesus Christ Crucified.” For this week’s selection, we present Haze in his previous incarnation, Hazel Wickers, in the story that brought O’Connor to the attention of the authors and editors who would champion her. O’Connor enjoyed enviable success soon after finishing her studies at the Iowa Writers’ Workshop in 1947. On the basis of her student work and a draft of her novel-in-progress, she received the Rinehart-Iowa Award of $750 and an option for her first book. “The Train,” the last of six stories in her MFA thesis (titled The Geranium), was accepted by the respected quarterly Sewanee Review, which published it as simply “Train” in the April 1948 issue. Another recent arrival at Yaddo was Alfred Kazin, who immediately took note of O’Connor’s work and alerted Robert Giroux, a junior editor at Harcourt Brace. When Lowell finally introduced her to Giroux in New York, O’Connor was faced with a dilemma rare for a first-time author: she had two publishers vying for her unfinished book. Angered by Rinehart’s criticisms (which she regarded as “addressed to a slightly dim-witted Camp Fire Girl”), she refused to agree to their extensive editorial changes. Rinehart ultimately released O’Connor from the option on her book, allowing Harcourt to publish Wise Blood in 1952. In “The Train,” as in the novel, Haze is traveling to Taulkinham, but the story’s final destination is a night in the train itself. Instead of a “slightly demented saint in the making,” Haze is a nineteen-year-old youth, alone and nervous and clumsy and haunted by the death of his mother. His thoughts are disturbed by the resemblance of a black porter to someone back home, by a chatty woman sitting near him on the train, and by the prospect of spending the night in the coffin-like sleeper berth. Thinking about the porter, he had almost forgotten the berth. He had an upper one. The man in the station had said he could give him a lower and Haze had asked didn’t he have no upper ones; the man said sure if that was what he wanted, and gave him an upper one. . . . If you don't see the full story below, click here (PDF) or click here (Google Docs) to read it—free! Flannery O'Connor wrote of people as they were. Today, as her story spills from the page it seems harsh in reference to race and poverty. This is the brassy description she became known for. I would love to know how she would have evolved in her writing had she lived longer, through the civil rights movement and into the 70's,though the horrors of the Vietnam War and coverage of all on TV. An observer and recorder of raw human emotion may have been overwhelmed. 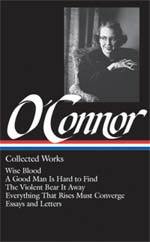 I have read O'Connor's complete works. She is consistent in putting human emotion under the microscope. Eudora Welty does the same but seems more to tout the heroics of the commoner. Carson McCullers paints the tragedy of the outcast evoking various emotions in readers as reactions to her representation of the human element. These writers are acclaimed for their daring to write stories that were not about the fun and glitz of the rich and famous. the brought the lives of every day people into the light and literature had a new page, indeed.